A regular breeding resident and migrant, the Wilson’s Phalarope was a rare species during the Minnesota Breeding Bird Atlas (MNBBA). The Wilson’s Phalarope’s primary breeding range is restricted to the northwestern region of North America, from central British Columbia south to northern California and east through the Great Plains. Small, localized populations are found in the Great Lakes region and at other scattered sites in the United States. Within the area surveyed by the federal Breeding Bird Survey (BBS), phalarope populations are most abundant in the northern Great Plains, including North Dakota, north-central Montana, and southern Saskatchewan (Figure 1). Ranked as a species of Least Concern by the U.S. Shorebird Conservation Plan Partnership and assigned a Continental Concern Score of 10/20 by Partners in Flight; officially classified as a state Threatened Species in Minnesota and designated a Species in Greatest Conservation Need by the Minnesota Department of Natural Resources. A long-distance migrant that winters in South America. Feeds on aquatic invertebrates obtained by probing the mud surface, and while swimming, by spinning in a circle to create a small whirlpool that brings prey items to the water’s surface. A shallow, ground scrape lined with vegetation. Breeding distribution and relative abundance of the Wilson’s Phalarope in North America based on the federal Breeding Bird Survey, 2011–2015 (Sauer et al. 2017). Previous to about 1900 it was an abundant summer resident throughout the southern and western parts of the state, every large slough or shallow lake harboring many pairs during the nesting season Then, for some not very evident reason, it almost entirely disappeared over much of this region for fifteen or twenty years. . . . Just as it seemed that it was about to become a bird of the past it began to reappear and has steadily increased until now it is back again over much, if not all, of its former range, though it is still far short of the old-time abundance. Not only had it returned to the central and northwestern regions of the state, but a few pairs even returned to nest “in the immediate vicinity of Minneapolis” (Roberts 1932), a city that was rapidly expanding its outer boundaries. Forty years later, Green and Janssen (1975) described the Wilson’s Phalarope as a summer resident throughout central and western Minnesota, yet “very scarce in many areas.” Their distribution map delineated a breeding range that included all but south-central, southeastern, north-central and northeastern Minnesota. Nesting had now been confirmed in 14 counties, including 2 records in eastern Minnesota in Aitkin and Anoka Counties. Considered most abundant in northwestern Minnesota, the phalarope’s status south of the Minnesota River was unclear. The most recent breeding record was from Lac qui Parle County in 1948. Breeding season observations farther south, in southwestern and south-central Minnesota, had not been reported during the 20th century, despite Roberts’s earlier comments regarding its abundance. A few years later, Janssen (1987) accompanied the Wilson’s Phalarope account with a more restricted range map. With the exception of Lac qui Parle and Lincoln Counties, where nesting had been confirmed in 1978 and 1979, respectively, all of southern Minnesota was excluded. Instead the species’ breeding range was now confined largely to northwestern Minnesota, stretching as far east as Aitkin and Morrison Counties. Notable in recent years were increasing numbers of phalarope reports in north-central Minnesota associated with the increase in local wild rice cultivation. Janssen also identified 8 counties where nesting had been confirmed since 1970: Aitkin, Big Stone, Lac qui Parle, Lincoln, Mahnomen, Marshall, Morrison, and Polk. Hertzel and Janssen (1998) later added 3 more counties to the list: Anoka, Lake of the Woods, and Wilkin. Beginning in the late 1980s, fieldwork undertaken by the Minnesota Biological Survey (MBS) detected 69 breeding season locations. In addition to known localities in Lac qui Parle and Lincoln Counties, new breeding season observations were documented south of the Minnesota River in Brown, Murray, and Nobles Counties. Records were also found in Anoka County and in several central counties, including Douglas, Morrison, Stearns, and Todd (Minnesota Department of Natural Resources 2017). Far fewer breeding season records were found nearly 20 years later by MNBBA participants. Only 31 phalarope records were reported in 28 of the surveyed atlas blocks and in 10 of the priority blocks. Breeding was confirmed in 4 blocks in widely dispersed counties: Lac qui Parle, Lake of the Woods, Polk, and Stearns (Figures 2 and 3; Table 1). The birds were observed in 18 of Minnesota’s 87 counties. Northwestern Minnesota remains the region with the greatest number of records; 21 of the 28 atlas blocks with records occurred in northwestern counties located north of the Minnesota River. Records were largely absent from the greater Twin Cities metropolitan region with the exception of 1 probable record in the southwest corner of Carver County. Five of the records occurred south of the Minnesota River (Figure 2). Unfortunately, this graceful shorebird remains a rare and sparsely distributed species in Minnesota, never having regained its widespread distribution and abundance observed during the 19th century. Its abundance also appears to have declined even further in the past 20 to 30 years. Similar changes are being noted throughout the eastern portion of its range, from Minnesota east through the Great Lakes states and south through Missouri where wetland losses have been significant. A small nesting population occurs in southeastern Wisconsin, and a few pairs occasionally nest in Indiana, Illinois, and Ohio and farther south in Iowa and Nebraska. Overall, the species is largely a localized and sporadic breeder east of the Great Plains (Rodewald et al. 2016; Russell et al. 2016). In contrast, the phalarope appears to have expanded its breeding range northward, particularly in Alaska and across Canada, from British Columbia east to New Brunswick (Colwell and Jehl 1994; Cadman et al. 2007). Breeding distribution of the Wilson's Phalarope in Minnesota based on the Breeding Bird Atlas (2009 – 2013). Summary statistics of observations by breeding status category for the Wilson's Phalarope in Minnesota based on all blocks (each 5 km x 5 km) surveyed during the Breeding Bird Atlas (2009-2013). Summary statistics for the Wilson's Phalarope observations by breeding status category for all blocks and priority blocks (each 5 km x 5 km) surveyed during the Minnesota Breeding Bird Atlas (2009-2013). During the breeding season, Wilson’s Phalaropes can be found in alkaline and freshwater wetlands (Figure 4). Their preferred habitat is generally characterized as a shallow wetland basin with mixed patches of open water and patchy emergent vegetation. The species has recently adapted to using wild rice ponds, and it is occasionally found at sewage treatment ponds as well (Potter et al. 2007; Russell et al. 2016). Most sites selected share three primary characteristics: open water, emergent vegetation, and an open shoreline (Dechant et al. 2002). Wetland complexes larger than 100 ha are generally preferred, and nesting usually occurs within 100 m of the wetland edge (Potter et al. 2007). Early in the nesting season, phalaropes are more likely to nest in drier upland vegetation, later moving to wetter meadows as the season becomes hotter and drier. Nesting occurs in native grasslands, sedge meadows, and shallow riverine wetlands. Conservation Reserve Program (CRP) grasslands, idle hayfields, and grazed grasslands are also used (Dechant et al. 2002). Typical breeding habitat of the Wilson’s Phalarope in Minnesota (© Lee A. Pfannmuller). Estimates of population size are derived from counts conducted at migration staging areas, where the birds congregate in large numbers. The most cited estimate is 1.5 million birds (Andres et al. 2012; Morrison et al. 2001, 2006). Approximately 55% of the population occurs in the United States, and 45% in Canada (Lesterhuis and Clay 2010). Data regarding the species’ population trend are scattered and often inconsistent. Roberts’s account of the species’ status in Minnesota certainly suggests a major decline from the more abundant numbers reported during the 19th century (Roberts 1932). However, because Minnesota is on the eastern periphery of the species’ range, the state’s population trend may not be indicative of the status of populations elsewhere. Overall, the widespread loss of wetlands in the early 20th century is considered responsible for a retraction in the species’ breeding range. Many shorebird biologists believe that a significant decline in numbers also occurred later in the 20th century, pointing to reduced counts at some key staging areas in the 1990s as well as reduced numbers at key wintering sites in Bolivia and Argentina (Lesterhuis and Clay 2010). Unfortunately, without consistent monitoring efforts, the species’ status and population trend remain uncertain. The only long-term data set available is that collected by the federal Breeding Bird Survey (BBS). The BBS may not be the best tool for monitoring wetland species, but it is the only annual survey that covers a significant portion of the Wilson’s Phalarope’s breeding range. Survey-wide, since the BBS began in 1966, the data show a small, nonsignificant decline of 0.48% per year from 1966 to 2015 (Figure 5). The BBS data are too sparse in Minnesota to provide reliable trend projections. An average of less than 1 phalarope is observed per BBS route in the state each year. Even in the core of the species’ breeding range, the highest densities are still relatively low, including an average of 6 birds per BBS route in North Dakota, 3 in Montana, and 4 in Saskatchewan (Sauer et al. 2017). Currently, it is unclear whether the species’ population is increasing, declining, or stable. While its breeding range has considerably expanded in recent decades, the species no longer breeds at a number of former sites, and the population has not shown a marked increase in size despite the expansion in range. Although a range of factors may be negatively impacting Wilson’s Phalarope populations, habitat loss and degradation are considered the most important threats, especially in the northern Great Plains. The impact of climate change, especially on major saline wetlands that are staging areas for large concentrations of the continental population, is also a major concern (Lesterhuis and Clay 2010). 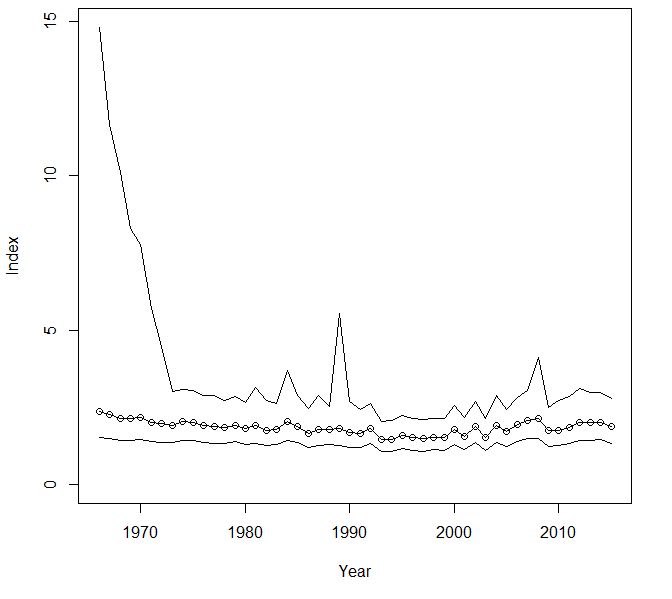 Breeding population trend for the Wilson’s Phalarope in North America for 1966–2015 based on the federal Breeding Bird Survey (Sauer et al. 2017). Despite the uncertainty surrounding its population status, the Wilson’s Phalarope was down-listed from its original classification as a species of High Concern by the U.S. Shorebird Conservation Plan in 2001 (Brown et al. 2001) to a species of Least Concern in 2016 (U.S. Shorebird Conservation Plan Partnership 2016). Recently the species was assigned a moderate Continental Concern Score of 10/20 by Partners in Flight (2017). A continental conservation plan for the species was prepared in 2010 (Lesterhuis and Clay 2010). In Minnesota the species is officially classified a Threatened Species (Minnesota Administrative Rules, Chapter 6134); it was upgraded from Special Concern in 1996 when intensive survey work conducted by the MBS in the northwestern counties revealed the species was absent from many sites with suitable habitat (Minnesota Department of Natural Resources 2015a). The Wilson’s Phalarope has also been designated a Minnesota Species in Greatest Conservation Need (Minnesota Department of Natural Resources 2015b). Specific management recommendations focus on protecting and managing the shallow wetland basins that provide critical nesting habitat. These temporary and semipermanent wetlands are especially vulnerable to alterations that impact the quality of the site, including agricultural activities that affect water quality and quantity. Impoundments designed to improve waterfowl habitat should incorporate measures that provide habitat for nesting shorebirds, including establishing nesting islands and beaches with sparse vegetation and gentle inclines (Dechant et al. 2002; Minnesota Department of Natural Resources 2015a). Russell and his colleagues (2016) suggest that including “exposed mudflats, especially with scattered small stagnant pools and water depths less than 5 cm are best” although the birds will forage in deeper waters. Sparse vegetation in uplands immediately bordering wetlands may be particularly important to nesting phalaropes. U.S. Fish and Wildlife Service field personnel in Minnesota experimented with limited grazing on western wetlands and documented a positive response by phalaropes (Robert Russell pers. comm.). Aggressive efforts to protect and restore Minnesota’s wetlands and grasslands should benefit this rare nesting shorebird. Current work by the consortium of conservation organizations and resource agencies under the umbrella of Minnesota’s Prairie Landscape Conservation Plan is an excellent example of the scope of planning and coordination that is needed to make measurable changes (Minnesota Prairie Plan Working Group 2011). Unfortunately, warming temperatures may have a devastating impact not only on the shallow, highly saline wetlands that are major migratory stopovers for the phalarope but also on its breeding habitat. A recent modeling analysis by the National Audubon Society predicted that the phalarope could lose 100% of its summer breeding range by the year 2080 as the Great Plains and Intermountain West become more arid, resulting in the drying up of shallow, seasonal wetland basins. As a result of their analysis, National Audubon classified the phalarope as a “climate endangered” species (Langham et al. 2015; National Audubon Society 2017). Indeed, this rare wetland species may become even rarer in the years ahead. Brown, Stephen, Catherine Hickey, Brian Harrington, and Robert Gill, eds. 2001. The U.S. Shorebird Conservation Plan, 2nd ed. Manomet, MA: Manomet Center for Conservation Sciences. Dechant, Jill A., Douglas H. Johnson, Lawrence D. Igl, Christopher M. Goldade, Amy L. Zimmerman, and Betty R. Euliss. (1999) 2002. Effects of Management Practices on Grassland Birds: Wilson’s Phalarope. Rev. ed. Jamestown, ND: Northern Prairie Wildlife Research Center. Morrison, R. I. Guy, Robert E. Gill Jr., Brian A. Harrington, Susan Skagen, Gary W. Page, Cheri L. Gratto-Trevor, and Susan M. Haig. 2001. Estimates of Shorebird Populations in North America. Canadian Wildlife Service Occasional Papers, no. 104. Ottawa: Canadian Wildlife Service. Potter, Brad A., Greg J. Soulliere, Dave N. Ewert, Melinda G. Knutson, Wayne E. Thogmartin, John S. Castrale, and Mike J. Roell. 2007. Upper Mississippi River and Great Lakes Region Joint Venture Landbird Habitat Conservation Strategy. Fort Snelling, MN: U.S. Department of the Interior, Fish and Wildlife Service.